With the continuous support from the Hong Kong Arts Development Council, Videotage organizes exhibitions, workshops, performances, artist-in-residencies and exchange programs to bring media art closer to our everyday life. Curatorial projects not only takes place at Videotage’s office at the Cattle Depot Artist Village, or formerly at the Oil Street Artist Village, but expands to different spheres in the public – at shopping mall, at school, and in collaboration with museum and art centre locally and worldwide. VMAC (Videotage Media Art Collection) was officiated in 2008 with mission to collect, preserve and build an extensive archive of video and media art of Hong Kong. Representing more than 20 years of development in media art, VMAC, that is opened to general public in 2011, together with the eight volumes of The Best of Videotage, a publication series that captures over 100 artists’ work in print, are of high significant educational value to the discourse of media archeology and art history in Hong Kong. Videotage, a listed media art organisation in UNESCO, has been long-term collaborator with other media art organizations to for the betterment of video art and new media art locally and worldwide. Videotage has been the strategic partner of Microwave International New Media Arts Festival, that celebrates its 15th Anniversary in 2011. Videotage is also invited to participate in the Venice Biennale of Architecture, Gwangju Biennial, Guangzhou Triennial, ISEA Festival and etc. International exposure also appears in form of exchange programs with the British Arts Festival, the Goethe-Institut, also participated in Remake HK, Project Unlimited organised by the Guggenheim Museum and Youtube in 2010.Videotage conceives new media art as a cultural movement that brings art and technology productions to nodes of intersections in the digital and network era. 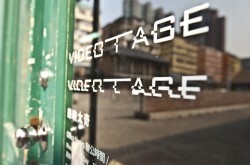 To promote a free and open DIY culture, Videotage begins to host Dorkbot-HK in 2010. The network will be a hotbed of creativity and innovation, where artist, technologist, academia, practitioner from both private and public spheres, actively engage with technology and address contemporary social, political and cultural concerns. With the success of Wikitopia in 2010, we will continue exploring how citizen media and social media reshape humankind in the era of network culture. We will also continue providing service and support to media artist and general public for the development of media art and strengthen the position of Videotage as a cultural hub of knowledge transfer for art, culture and technology in the local, regional and international regime.